There can be many reasons why a professional soccer player has a hard time finding success in his own country. Perhaps the level is too high for him, he might be overlooked, or his style isn’t compatable with the nation’s way of playing. Playing abroad can be an option for these guys. Here are eight players that went abroad and became very popular players in their new home country. Croatian striker Mirko Grabovac started his career with Primorac 1929, the club of his home town Stobrec, playing in the top flight of Craotian soccer from 1993 until 1995. Grabovic only managed four league matches in those two years. He moved to Cibalia Vinkovci for one season (16 matches, 2 goals) and later to NK Zadar and back to Primorac 1929. In 1999 he left Croatia, and tried his luck in Singapore with Singapore Armed Forces. Twenty three league goals and the top scorers crown in his first season were followed by nineteen goals in his second – again clinching the top scorers title. Grabovac got his third, fourth and fifth title in 2001 (42 (!) goals), 2002 (36 goals) and 2005 (26 goals). The last one was while playing for Tampines Rovers, the club he switched to in 2004. Two years later he beat Brazilian-born Egmar Goncalves as the best goal scorer ever in the Singaporean S-league. Grabovac returned to Croatia, been capped twelve times for the Singaporean national team and four league titles (2000, 2002, 2004 and 2005), in 2008. 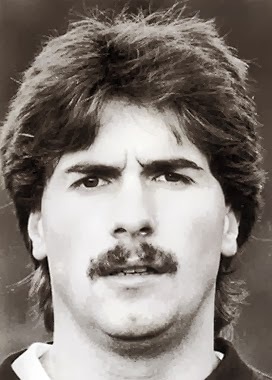 Armin Krings was born in Mönchengladbach in 1962 and was, since he was ten years, part of the much praised youth plan of Borussia Mönchengladbach. At 18 years, Krings doubted if he could make it into the first team. And as Avenir Beggen had a friendly relationship with Borussia’s manager, Krings tried his luck some hundred plus kilometers down south. At Beggen, it was love at first sight for the young player, as he immediately was crowned top goal scorer in the league with 25 goals from 22 matches. In the next four years he repeated that feat three times, and by 1987 he was asked to become a Luxembourg citizen and play for the national team. In the next years he was capped fourteen times (one goal). Krings played for Beggen until 1997 and collected a total of 256 league goals, a goal scoring record for Luxembourg. His other titles, besides being the best goal scorer six times, are impressive as well: five times league champions, six times cup winner and six times leading goal scorer. Willy Lippens was actually born in Germany, with a Dutch father and Dutch nationality. He was nicknamed ‘Die Ente’ (the duck) for his waggling walk and made it his trademark to dribble past defenders, waiting for them to return and tried it again. He also was a winger with great scoring ability. With his relatively small club Rot Weiss Essen he gained promotion to the Bundesliga in 1966. He mostly fought against relegation, not always successfully. At Essen he spent five seasons in the second division. Still, Lippens was considered world class by the Gemans, who really wanted him to play for the national team. But as his father was severely tortured by the Nazi’s, Lippens never applied. He did play for the Dutch team though, just once. In 1972, he scored the first goal in a 6-0 victory over Luxembourg. It was no success, as his Dutch teammates were rather unkind to him, being half-German. They mocked him and it was clear they wanted Ajax-player Piet Keizer on that position in the team. He was never asked again. During his Bundesliga years with Rot Weiss Essen he played 179 league matches, scoring 79 goals. For Borussia Dortmund (1976-1979) he played another 70 league matches (13 goals). And while Dutch players were mostly active in the NASL with Los Angeles Aztecs and Chicago Sting, Lippens was part of the German clan at Dallas Tornados in 1980. At 23, Josef Miso left his country Slovakia where he had played for Spartak Trnava, but never reached the first team. He relocated to a club called Piestany, with whom he won promotion to the third and a year later the second Slovakian division. Then he played a friendly match with his club against LD Alajuelense and he was asked to join them. Always dreaming of Mexico, Miso did teh next best thing and said yes. 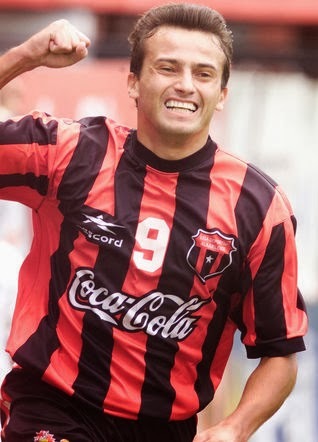 Miso scored a modest six league goals in his first year at LD Alajuelense. He wasn't really a killer upfront, more a teamplayer who gives his team mates chances to score. During his nine years at Alajuelense, the club won six championships, two international cups (the Copa Interclubes Uncaf (1996 and 2002) and reached the final of the most important cup, the Concacaf Cup in 1999. LD Alajuelense lost that final against Mexican club Necaxa 2-1, despite Miso scoring from the penalty spot to give them the lead. After 2003, Miso played for a number of other Costa Rican clubs and one Norwegian club, before hanging up his boots in 2008. With his total of 87, Miso is the foreign player with the most goals in Costa Rican first league history. Miso stills lives in Costa Rica, coaching young players. Chima Okorie came as a young student to India, to Visakhapatnam. There he started playing soccer, first just for fun. But as he was scoring lots of goals, he signed a contract with Mohammedan in 1985 and played in the Calcutta League. Two years later he moved to East Bengal where he was crowned top goal scorer several times, as he was after his transfer to Mohun Bagan in 1991 (as the first foreign player ever to play for this club). With his reputation as a lethal striker, Okorie did try his luck in Europe. He had stints in England (Grimsby Town, Torquay), Scotland (St. Mirren), Norway (Sogndal) and Denmark (Viborg, Ikast), but failed to make a big impression. He returned to India in 1997 and immediately had his impact in the newly formed (in 1996) Indian national league. With Mohun Bagan he won the title (97/98), and stayed for another season until he was suspended for assaulting a referee. Ruy Goncalves Ramos Sobrinho, born in Rio de Janeiro, was a gifted midfield player from Brazil, who really didn’t have a career in Brazil. At 20 years old, he decided to play in Japan, as one of the first foreign players. 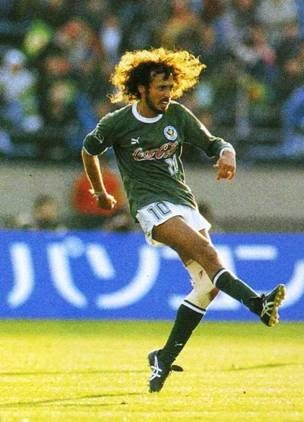 Playing for Yomiuri – later that name changed into Verdy Kawasaki – he became a hero over the next years. Ramos married a Japanese girl and decided in 1989 to apply for Japanese citizenship. A year later he made his debut for the national team, already 33 years old. Still, he managed to collect 32 caps (1 goal). Ramos didn’t retire until he was 42, so he also played six years in the J-League, although bt that time he had lost his scoring ability. With a total 462 league-matches and 78 goals, Ramos’ popularity in Japan even surpasses that of players like Kazuyoshi Miura and Hidetoshi Nakata. Maybe Keisuke Honda, now with AC Milan, can challenge him on that aspect. 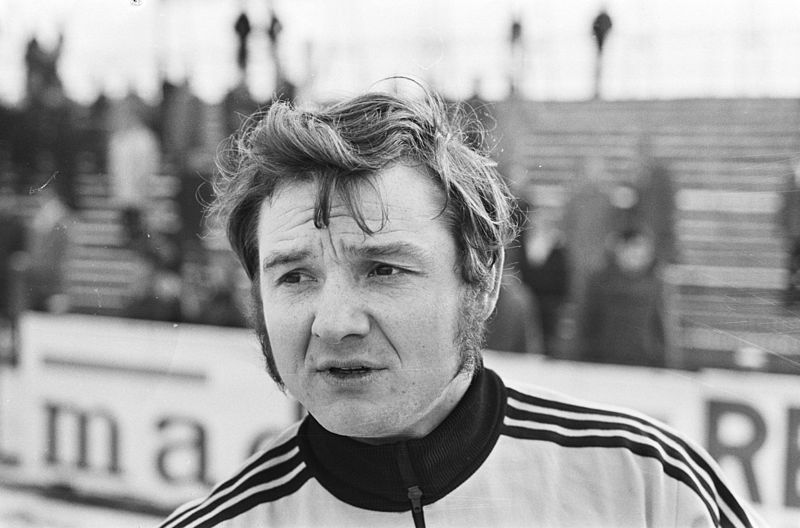 German Rainer Raufmann had a mediocre career in his home country, mostly playing his soccer in the German second division. He did score four Bundesliga goals for Eintracht Frankfurt in 1995-96, though. After a nine month loan to Austrians LASK (15 matches, 3 goals) from Arminia Bielefeld, Rauffmann makes the best decision in his career: going to play soccer in Cyprus. His club Omonia Nicosia wa one of the big clubs on the island, so he presumed correctly that he would be able to score some goals. Of course the standard of play was a lot lower, but the difference was flabbergasting: Rauffmann starts banging in goals like crazy. In his first season he scores 42 (! ), then 35, 34 and 30. Even as a 35 year-old he starts the 2003-04 season well with three goals in four matches. But unfortunately, Raufmann then gets injured and has to retire. With 192 goals scored in just 151 matches, he is a real king in Cyprus, who also helped his club win two championships and one national cup – scoring twice in the final. And he had the honor of playing for the national team of Cyprus five times, scoring three goals. Raufmann still lives in Nicosia, is married to a Cypriot girl and works as a soccer scout for his former club. As a youngster, Dale Tempest started playing soccer in the English second and third division, with Fulham, Huddersfield Town and Gillingham. 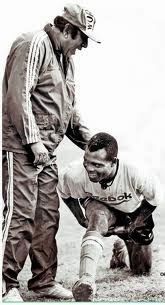 His first adventure abroad was with Belgian club SK Lokeren in 1986-87. It was kinda good, but when he returned to pre-season training overweight Tempest was dropped by the new manager, Dutch international Wim Jansen. So he returned to England (Colchester) for two seasons, without making many headlines. Tempest then let money decide where he wanted to play and set sail for Hong Kong, where he was signed by South China. During his career in Hong Kong he also played for Eastern and Kitchee and was crowned league top scorer a record five times in his first six seasons. After that, Australian striker Paul Foster got in his way. As most of the players in this list, Tempest had the honor of becoming an international player for his new country. He wore the Hong Kong jersey six times, and managed to score two goals. Still, Tempest claims that his real soccer career was over the day he signed for South China. Only the very poor standard of play and his own work ethics made him a Hong Kong hero, not his improved soccer skills.